I knew something good was in the air. The weather folks predicted a few consecutive days of hot weather, then we got warnings of a heatwave. Britain was finally going to get hot weather in July. In most places, this is better known as summer. The nation went into a frenzy. Sales of swimwear and sandals went through the roof, while offices whacked up the air con to recreate mid-winter. I responded in the best Indo-Brit way I knew: stripped the kids down to their undies, gave them a mango each and pointed to the paddling pool in our shady garden. Then nosedived into the largest vat of Pimms I could find, surfacing from time to time to marvel at the wonders of pale Provencal Rose and Sipsmith Summer Cup. The only thing to cook, in hot weather, is kebabs in my humble opinion. Out came the barbeque and on went Tandoori Chicken, Lamb Chaanps, Seekh Kebabs and Paneer Shashliks, served with vegetable pulao and summery yellow dals. Also, chillies. Plenty of them. Because when its hot, chillies keep you cool. And even if they don’t, your tongue will burn so much, you won’t notice much other discomfort. For the opening gambit, I simply threaded a row of fat red chillies onto a skewer and drizzled lightly with oil before flash grilling. The second barbeque, I scooped out the inside of the chillies, stuffed them with mango pickle, dipped them in a Besan batter and shallow fried them. The third time, I went for a Hyderabadi Chilli Curry I have been meaning to try for yonks: Mirchi Ka Salan. This is a to-die for dish with the intense flavours of chillies smothered in a peanut, coconut masala. I was always put off by the long list of ingredients, but with a bit of quick thinking (and general laziness), it wasn’t too onerous and a fantastic side to grilled meats. Or even as the Sabzi on the side to a low-fuss yellow dal. Do wash your hands well before wiping your tears as you eat this. Don’t eat them all at once. And lets hope summer lasts forever! Wash and pat the chillies dry. Make a lengthways slit in each and use a small teaspoon to de-seed each one. Next, slice the onion. In a large frying pan, bring two tablespoons of the oil to heat on high. When it’s sizzling hot, saute each chilli until pale brown on either side. Set aside to rest on a plate, while you add sugar to the same pan and fry the onions to a golden brown colour. Mix in the garlic and ginger and fry for another two minutes until the masala turns a darker shade. Take the pan off the heat and leave to rest. Now, dry roast the peanuts, sesame seeds, coconut and whole spices in another frying pan for two minutes until you can smell the ingredients in the kitchen. Put these ingredients, along with the onion mixture into a food processor and whizz until you get a smooth mixture. Add a bit of cold water to help you along. Then, bring the pan to heat again and add the last teaspoon of oil. When it’s hot, toss in the mustard, cumin seeds and the curry leaves and as soon as they start sizzling, stir in the ground masala paste. Saute for two minutes, then add half a pint of warm water and bring to a boil. Then lower the heat, and simmer for 10 minutes. The curry will thicken as it cools, so make sure it’s moist before you move onto the next bit. Finally, mix in the tamarind paste, salt to taste and place the green chillies gently in the masala. Mirchi ka Salan is best enjoyed sizzling hot, with a bit of yoghurt handy! Wow, this sounds delicious, full of complex flavors. Happy summer, Mallika! looks gorgeous!! this is the best looking mirchi salan i have seen in a while! This is very flavorful !! Really loved this, it reminded me of my two months walkabout in India. 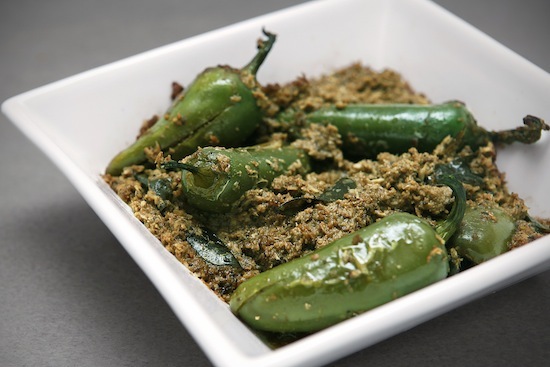 which are generally hotter than poblano. Thank you for your recipe!